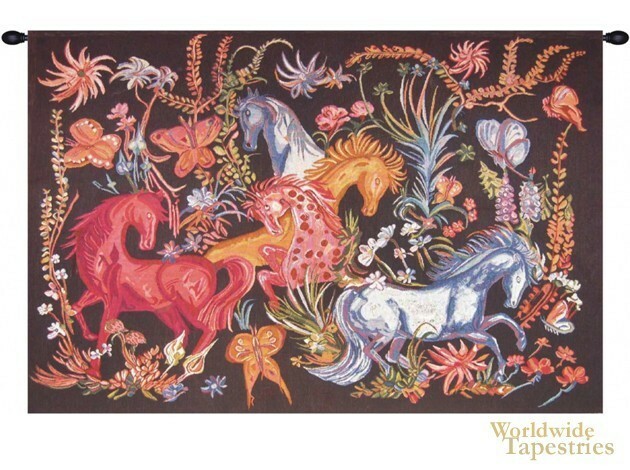 Cheval Azures tapestry shows a fantasy scene of horses and butterflies based on the work of artist Dom Robert (1907-1997). Here we see a flurry of activity of horses and butterflies among flowers and plants on a dark background. The colors are surreal including red and orange horses to create a superb collage of animals. This tapestry is backed with a lining and a tunnel for easy hanging. Note: tapestry rods and tassels, where pictured, are not included in the price. Dimensions: W 44" x H 33"